Barbas' origins are unknown, though ancient idols and cave paintings dating back to the Merethic Era depict Clavicus Vile standing with a large hound by his side. It is sometimes believed that Barbas is a merely a greater Daedric servant to Vile, though others suggest that Vile and Barbas are in a sense the same person, split into two beings, as Clavicus Vile's very social nature would make it impossible for him to not have a companion. In 2E 582, a novice Altmer mage named Pircalmo was hired by the Bosmer inhabitants of Willowgrove to clear the nearby forest. However, Pircalmo's ability with magic was limited by his constant mistakes. Before attempting to cast his spell, the mage wished for it to "work well". Unbeknownst to him, his wish was granted by Vile, who had an ancient and forgotten altar inside a nearby cavern. Pircalmo's spell "worked" in that it summoned a horde of dangerous atronachs to burn down the forest. Having seemingly failed the contract, Pircalmo's wife was duly taken by the local Bosmer to be killed and eaten. Fortunately, the Soulless One discovered the altar, which Barbas had been inexplicably bound to due to the mage's wish. The Soulless One then smashed the altar, freeing Barbas and dispelling the atronachs before Pircalmo's wife could be harmed. That same year, Barbas appeared as Creeper when an Orc merchant named Zagrugh summoned a scamp to act as his assistant. Zagrugh ran a general store beneath the city of Mournhold, in a Dunmeri ancestral crypt which had been taken over by outlaws. He had hoped that a summoned Daedra would be more loyal than his previous assistants, who had all stolen from him. Mysteriously, Zagrugh was later found dead, and Creeper stepped in to manage the store. Around 2E 583, Barbas and his master carried out an elaborate plot to gain access to the Clockwork City. Barbas began tampering with the construction of Vivec City, eventually disposing of Tribunal Temple Archcanon Tarvus and impersonating him. They used a powerful staff created by Sotha Sil, Sunna'rah, to steal Vivec's divine energy and use it to discover the Clockwork City's location. They succeeded, and Barbas entered the City to arrange Clavicus Vile's arrival, but was stopped by the Soulless One and the mage Barilzar, who pursued him into the City. When Cyrus visited Vile's realm in 2E 864, Barbas showed a fondness for the Redguard and shapeshifted his face to imitate Cyrus'. Circa 3E 427, Barbas took on the form of Creeper to live and trade with a group of Orcs in Caldera, Morrowind. In 3E 433, Vile tasked the Champion of Cyrodiil with recovering the Umbra Sword. Barbas foresaw the ruin that the sword would bring to Vile's realm of Oblivion, and left Vile's side to manifest as a dog statuette. Through the statuette, Barbas communicated with the Champion in an attempt to dissuade the Champion from bringing Vile the sword, although this attempt proved futile. Umbra later stole much of Vile's power and created Umbriel, leaving the Prince's realm crippled. When Sul and Prince Attrebus Mede visited Vile's realm circa 4E 40 to bargain with the Prince, Barbas helped in negotiations. By 4E 201, Vile had forsaken Barbas out of annoyance. 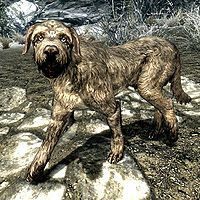 Barbas, in the form of a dog, was left wandering the Pine Forest of Skyrim. This limited the Prince's power, making it so that he could only manifest in Tamriel close to one of his shrines. Residents of Falkreath took notice of the stray mutt, and when the Last Dragonborn approached him, Barbas revealed his identity and asked the Dragonborn to help him reconcile with Clavicus. The two journeyed to the Prince's shrine in Haemar's Shame. After killing off the vampire worshippers, Vile had the Dragonborn retrieve the Rueful Axe, an artifact of the Prince. Vile then presented the Dragonborn with a choice: keep the axe and kill Barbas in his mortal form, banishing him for a few centuries and allowing Vile to use his full power; or continue with the original deal, forcing the Prince to take both the axe and Barbas back. It is unknown which option the Dragonborn chose. Clavicus Vile was depicted with a hound in both Daggerfall and Redguard, and Creeper appeared in Morrowind, but it was not until Oblivion that the name Barbas came into use. The Mad God Sheogorath dislikes Barbas, and may have plans to kill him with hemlock. For game-specific information, see the Oblivion, Skyrim, ESO and Legends articles. For information on Creeper, see the Morrowind and ESO articles. ^ Barbas' dialogue in Oblivion.